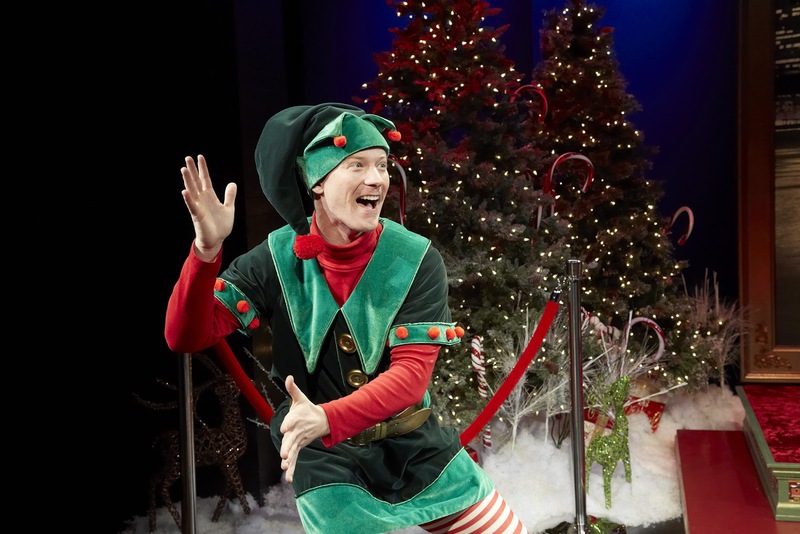 A bunch of “ho, ho, hos” can be heard over at TheaterWorks in Hartford, but there isn’t a Santa in sight. The laughter is coming from the audience listening to a disgruntled elf in The SantaLand Diaries by David Sedaris. 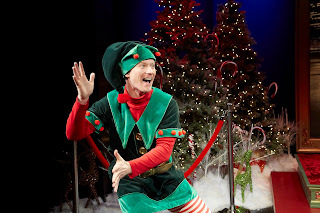 With tongue firmly planted in cheek, “Crumpet,” as he is known in SantaLand, shares numerous stories about his various elf stations (pointing, photos, cash register . . .) and the people he encounters, some bordering on crass, but all very funny. There are the kids – some more than reluctant to sit on the lap of a fat guy dressed in a red velvet suit – and their parents, consumed with holiday cheer – or chill – to get just that right photo with Santa to send off to relatives and friends. The Santas also provide humor. They range in personality from totally deranged to one who sounds like Saint Nick himself. Kready, dressed in full elf garb that incudes candy-cane tights (Margaret Charbonneau, costume design), often reclining in an ornate Santa throne decorated with a background of Christmas trees (Michael Lenaghan, set design), brings personalities to life with recreations of SantaLand moments under the direction of Rob Ruggiero, TheaterWorks’ newly appointed producing artistic director. Mantello’s adaptation doesn’t erase the sound of written essay from the dialogue, unfortunately, but Kready employs personality and facial expressions to make it personal for a live audience, which otherwise might feel like it was listening to someone read a radio script. In fact, one of the most amusing parts of the one-hour presentation is hearing audience members lose themselves in laughter when a story about a weird Santa or elf, or an out-of-control parent, hits home. (The “spitting Santa” was the one that got me). It’s very amusing, though some of the accounts are rather crass, border on cruelty and some wouldn’t pass the “politically correct” test. No one under 16 is allowed in the theater. Photo ops with Crumpet are available as a theater fundraiser following the performance. The limited run of The SantaLand Diaries runs through Dec. 23 at TheaterWorks, City Arts on Pearl - 233 Pearl St., Hartford, Tuesdays, Wednesdays, Thursdays and Sundays at 7:30 pm; Fridays and Saturdays at 8 pm Weekend Matinees at 2:30 pm. Tickets $17-$53 (860) 527-7838; http://theaterworkshartford.org.